If you are looking for a splendid charming Umbria villa in Città della Pieve for a holiday in Italy, look no further. Villa Cerqualto offers everything and a bit more for a romantic, comfortable, relaxing, vacation to remember for years to come. And as usual at a great price for you. The high value of this villa that rents at an incredible minimum of 700 Euros per week is given by the many comforts and delightful details, not to mention the unforgettable location, it boasts. Umbria Villa Cerqualto is a private residence with a rustic, lavish and incredibly charming character, arranged for max 8 persons. It sits among immense oaks and it was recently restored using local natural materials. Refined design and antique pieces of furniture passed along the owner's aristocratic ancestry adorn the property. This Umbria villa is 2 centuries old. The location is on an elevated point with unsurpassed panorama. The olive garden is the placid cradle of the pool area, a soothing spot fitted with sun beds and sun umbrellas. With the exception of the high season, the house can be partially rented at a lower price. The estate of the property extends over eight hectares where organic olive oil and wine are produced by the owner. The ground floor is accessed through a large exterior set of stairs. Entering the house brings you in the library fitted with a twin bed. From here you get to a roomy master suite boasting a king-size bed, private bathroom and wooden beamed ceilings. The first floor is located over the study room. Here is a sitting room from whose windows Monte Cetona gives pleasant sights. In here you can accommodate two extra guest with a double sofa bed. The fire place and large bathroom with shower complete the comforts of the room. Next there is a sitting area and then the very old kitchen, which after two centuries has not changed its essential shape. However, it is fully equipped with modern day equipment. From here you can get to the balcony, lined with deck chairs to relax in front of the marvelous setting sun. Raising to the second floor from the cooking area you find the yellow and blue rooms. They are next to a very roomy bathroom featuring a fine looking double sink and window-walls almost all around to meet an unparalleled sight of the scenery all around. The view from the yellow room looks over the ancient hamlet Monteleone d'Orvieto. The blue room is the most well appointed one including a spacious patio and sights of Mount Amiata where to go skiing in wintertime, or hiking in summer time. 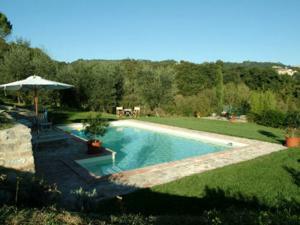 Umbria Villa Cerqualto is an unforgettable stay to spend your holidays in Italy.